Your season is over. Now what? Home / Uncategorized / Your season is over. Now what? Your season is over–Now what? 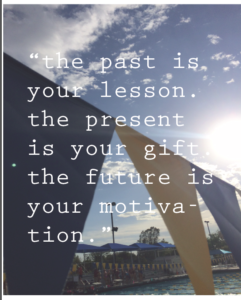 3 steps to get the most from your past season, and get the new season off to a great start! After resting up, and taking some needed time off from the sport, use the time period at the end of the season/year to reflect, evaluate, and take serious inventory of your performance during the past season. Do you feel you should have finished better? Placed better? Had faster times? Was it worthwhile? Awards banquets offer a great opportunity for reflection—a symbolic bridge which covers the space between closing one season and beginning a new one. One banquet I attended, a graduating senior was given time at the podium to address his teammates and gave a great example of reflection stating how in the past 10 years he had swum more than 11.5 million yards! Which, he went on to state, calculated into more than 7000 miles! He had dutifully recorded every yard he had ever swum, and upon retiring from the sport with victory, and graduating from school with honors—he was able to take inventory of his training and accomplishments and say it was, indeed, all worthwhile. What an impressive statement to know that you have not only swum 11 million yards, but have the hard copy swim logs to prove it. It is one thing to say you have put in a lot of work into a season, but quite another to have an actual figure of how much work was actually done! As you reflect on your past season, ask yourself the tough questions: Did you go to all the workouts? Were you prepared for workout? Did you take stretching and dryland training seriously? Correctly? Consistently? Did you goof off during warm-up? Can you say you never cut corners? Did you spend time in every workout doing one thing better than the day or week before? Did you record your achievements? Did you write any goals down on paper? Did you have fun? Did you get out of workout and say “Thanks coach!”? Step 1—Take inventory of your past performance; then close the door on last season, pack up your bag with what you learned from asking yourself the tough questions—and cross over the bridge to the new season. Then, open your bag and use what you’ve put in it. Look forward—your new season starts today! If your answers to any of the tough questions were not positive, then you already know where you need to begin approaching the new season. The new season starts today. Begin by setting new goals. 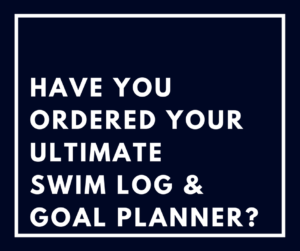 Get a log book and start putting goals down on paper. Look at the big picture first—where you want to be at the end of the season, and then fill in the details on how you want to get there. Most importantly, remind yourself daily that the “details” happen every day in workout! We all know how unforgiving a sport swimming is—there is no swimming bank account that earns interest if left alone—you have to put something into the sport everyday or you end up adding additional interest fees to your principle investment. Step 2–Invest in the details of your new season. Instead of blindly swimming each workout just to get it behind you—find something to focus on that makes you better. For example, have you ever tried concentrating on each arm movement for a full lap? Sure, that’s easy—well what about for a full 200? Or a full workout? Making sure you feel the water pressure on your hand throughout the whole pull cycle, each stroke, can be more exhausting than you ever realized. It is improvement in the small details, as in this example, that will take you to the next level of improvement at season’s end. Finally, make sure you are your own boss when it comes to your success. Don’t let an award determine whether or not you have accomplished something important in a season. Only you know the improvements you have worked on and accomplished throughout the season, so make sure you celebrate them. Remember to log your achievements—great or small, and share them with your coach and support group. 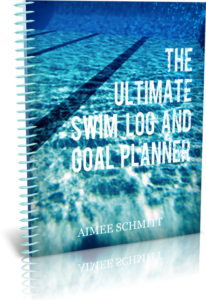 One athlete calls her log book her “Triumph Log” because each day as she is pushed in workouts by her coach, she records sets and times she never thought she would be able to accomplish. Small, personal improvements are the building blocks to carry with you each season, build confidence, and add up to an overall successful season and career. Looking back at my own personal swim career—it is bookend-ed by two “Most Improved Swimmer” awards. One at age 7 from my first swim team, and the latter my senior year at college. I started the sport “most improved” and finished my career as “most improved”. 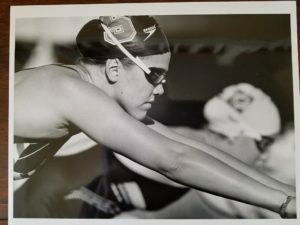 I had been a part of a national team title, several American Record relays, All-American awards, as well as national team berths, and at that time, receiving “Most Improved Swimmer” just did not sound that important. In fact, it left me with a funny sense of disappointment. “Is that it?” I thought. “Most Improved?” It was years before I could appreciate the full significance of such an award to appropriately close my season and my career. The journey was always about continuing to “improve”—not just striving to “arrive” at success. No one gets an award for “finally arriving” at success. Step 3—Strive for the process of improving. Find the “Most Improved” areas at every stage in your career. Being most improved means you are successful whether others notice or not—the important thing is you know. Take time to rest and evaluate, and put a plan to paper. The new season will start in a few weeks. You got this!